MELBOURNE, Australia — Little did Angelique Kerber know when she turned 18 at home in Bremen, Germany, that the next decade of celebrating her birthday would be spent some 16,000 kilometers (10,000 miles) away at the Australian Open. She was serenaded off Rod Laver Arena to "Happy Birthday" from the crowd. 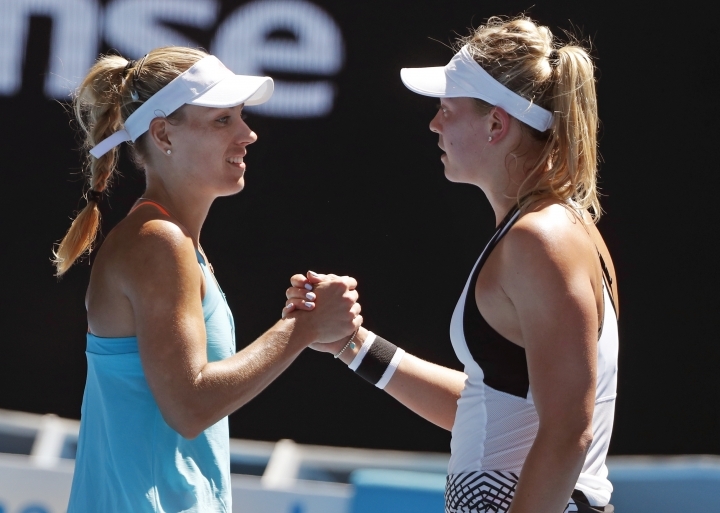 "I just remember celebrating my 18th birthday at home, so that was a big party," Kerber said. "But the rest, I was always here. It's nice. I'm feeling at home, so it's great to be always in Australia for my birthday." She wasn't always celebrating on Wednesday, visibly angry with herself at times during the match. "I was making a lot of mistakes at the important moments," Kerber said. "The conditions were, like, also a little bit difficult, particularly with the sun from the one side." She managed to keep her emotions in check in the first set, but became frustrated at times with Witthoeft's powerful and accurate forehand in the second. In the tiebreaker, she led 3-2 but double-faulted twice — once on either side of the change of ends — and Witthoeft won five straight points to level the match. Kerber next plays Kristyna Pliskova, who beat No. 27 Irina-Camelia Begu 6-4, 7-6 (8). Pliskova's twin sister, Karolina, lost the U.S. Open final to Kerber. Asked if was strange to be playing a twin sister, Kerber said: "I don't know if it's weird. I mean, the one is right and the other one is left-handed. So this is the difference. "But I played once against her (Kristyna), I think, few years ago, and I know that she has a great serve, as well ... I will look forward to playing against her." "I think we will go for a nice dinner," she said of her birthday night plans. "I don't know yet where, but it will be nice. Maybe sit there with my team and friends and just relax a bit."